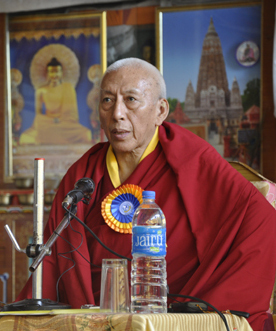 DHARAMSHALA: Former Kalon Tripa Prof Samdhong Rinpoche has said those who do not support the Middle-Way Policy are not against His Holiness the Dalai Lama, as the policy is not imposed by him but democratically adopted by the Tibetan people and the Parliament-in-Exile. Prof Rinpoche made the remarks at a two-day conference of Tibetan People’s Movement for Middle Way last week, underlining the importance of removing the misconception that those advocating Independence for Tibet are against His Holiness the Dalai Lama. The Middle-Way policy was adopted through a democratic process by the Tibetan people and the Tibetan Parliament-in-Exile, and not imposed by His Holiness the Dalai Lama, he said, adding, so it’s wrong to construe that those who don’t support the Middle-Way Policy are against His Holiness the Dalai Lama. Rinpoche strongly emphasised the need and importance of divergent views and lively debates in a healthy democracy and added that whether it is independence or the Middle Way, the real aim of both of these ideologies is the welfare of the Tibetan people. Prof Samdhong Rinpoche underlined the need to raise awareness on the achievements and long-term benefits of the Middle-Way policy. The two day meeting was attended by Tibetan activists, Parliamentarians and representatives from 23 regional chapters.